Atlanta has seen its portion of ice over the years and as you may recall we haven’t had the best of luck in handling it. But good news! WSB TV is rolling out a new ice prediction tracking system. It’s called the SPIA index. 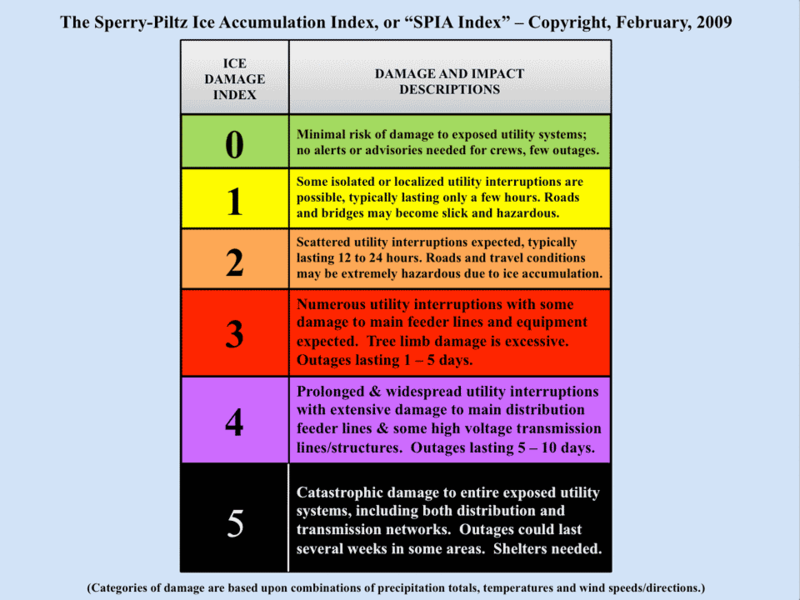 The SPIA index stands for The Sperry–Piltz Ice Accu mulation Index. It is a revolutionary tool that guesstimates ice accumulation and ice damage using an algorithm of researched parameters that, when combined with National Weather Service forecast data, predicts the projected footprint, total ice accumulation, and resulting potential damage from approaching ice storms. It is a tool for risk management and winter weather preparedness. An ice storm is a type of winter storm characterized by freezing rain, also known as a glaze event or, in some parts of the United States, as a silver thaw. The U.S. National Weather Service defines an ice storm as a storm that results in the accumulation of at least 0.25-inch (6.4 mm) of ice on exposed surfaces. From 1982 to 1994, ice storms were more common than blizzards and averaged 16 per year. They are not violent storms, but instead commonly perceived as gentle rains occurring at temperatures just below freezing. For this reason, people may be unaware of the danger if it happens overnight. Currently, the SPIA index has been used in other states in the Midwest like Oklahoma. WSB-TV of Atlanta will be the first station in the Southeast to employ this new technology. Ice damage can be a costly affair. The 2014 Ice Storm of Atlanta was estimated to cost 25 million dollars to our economy. Also, it was reported that Georgians filed 75 million dollars in claims. Using an SPIA Index could have dramatically reduced that cost. As a tree service company in Atlanta, we strive always to be on top of any inclement weather. Putting our tree service crews near danger areas, so that we can be first on the scene for Emergency Tree Services during an ice storm. We also encourage our community to be pro-active in tree trimming dead limbs that could potentially cause catastrophic damage in an ice storm event.